Discussion in 'WW2 Forums/Forces Postal Service' started by Otto, Aug 12, 2017. 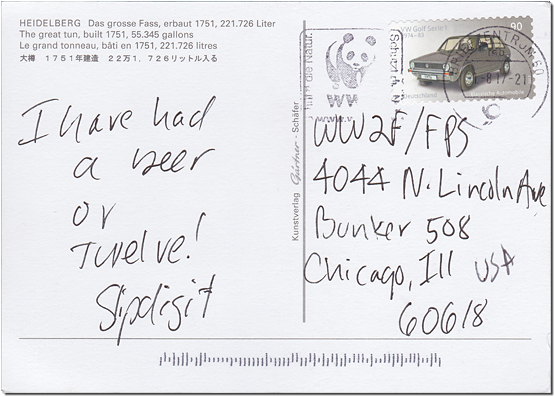 Slipdigit followed up from his last spirit inspired postcard with a similar 12 bier submission from Heidelberg. Cheers Jeff! gtblackwell, George Patton and The_Historian like this. German beer, the best stuff. Jeff's handwriting seems to indicate it was written closer to the 12 beer mark. I cut my 'imported beer' teeth on Becks. Then I discovered Guinness, and the British defeated the Germans once again. Lots of good options these days when it comes to beer, the US market in particular has exploded with quality brews. I'd be very happy to drink anything that came from that old keg though. If you combine the size, the frontal adornment, and the rack on top that looks quite like a howdah, it looks quite like a war elephant to me. I bet Amblev rues the day that bought Budweiser for several gazilliojn dollars. ( Was it not in the 60 billion range, seriously). Americans have really taken to small local or regional brewers..
Jeff, thanks for the update. Lots worst places to be than Heidelberg. Beautifully situated city. In a few short years, the world of beer has changed dramatically for the better, particularly in Chicago which is a hub of craft beer. When I was in college, the term "beer snob" was unthinkable. These days it's fairly common to go to a pub/restaurant find they don't offer anything Bud/Coors at all. Welllllll.....I have to admit that the postcard actually showed a wine barrel. It was quite large. But I really did have a beer or twelve. I was there on business with my employer but was able to slide a bit of sightseeing in. 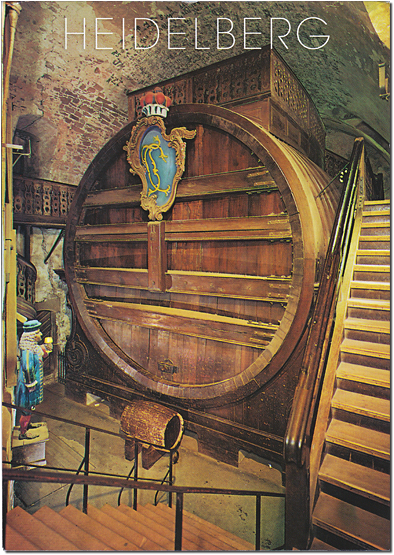 This barrel was in the castle overlooking Heidelberg. 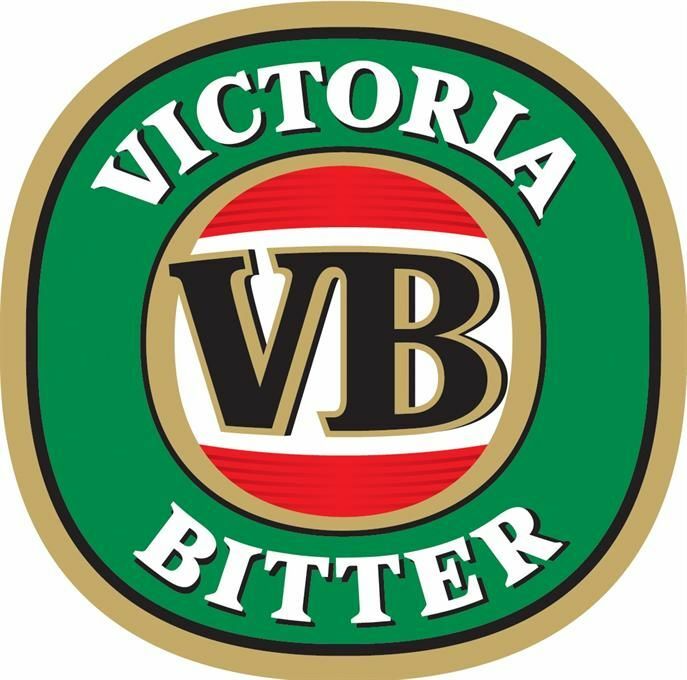 I remember back in the early 80s a quality Australian brew called Tooth KB being available in the UK in limited quantities. It was a welcome change from the dishwater lager we were served here. Am I correct in saying the brewery is now closed down? Never cared much for German beers for some reason. Belgium yes and many from the British Isles. Now we have lots of good microbrews even in some of the smaller towns. Yes, there are some excellent microbreweries these days. My neighbour bought a barrel from one in Cheshire for a party he held not so long ago and it was very good beer. So much so that I didn't even suffer from the usual raging morning after the night before hangover the next day! Gotta love the stamp on the postcard commemorating the Series I Golf (Rabbit in the US). The GTI version was the original "hot hatchback". Wished I could lay claim to that little detail, but the hotel put it on there for me. Both brewing and vinification are an odd blend of solid science/lab technique with an artists touch. A few years back I brewed a few small batches of beer with my brother, an enjoyable hobby to be sure. The fact you can imbibe the product of your effort is a strong incentive to execute well. In any case I could talk beer all day, so rather than hijack the thread in that direction, I'll kindly digress. I should say I do appreciate the "likes" I've received for this thread, but this thread only exists because Slipdigit sent in a postcard. It would be more just to "like" the first post of Slipdigit in this thread, rather than mine. A bit OT but I did like the ability in the old forum to rate threads as well as like(salute) posts.